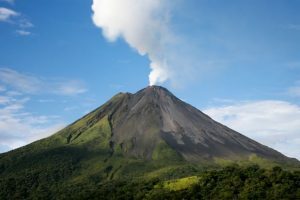 Costa Rica has wonderful places, forests, and jungles to explore with tours in Manuel Antonio, and excursions enjoying landscapes that fall in love, most of all its cloud forests, which give life to a great fauna and flora never seen before; in Manuel Antonio you live unique adventures. 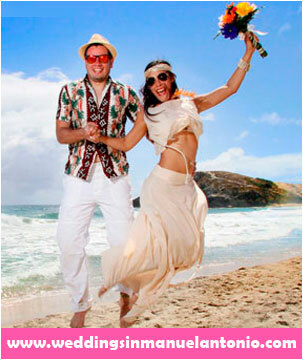 ¡Tour Catamaran in Manuel Antonio! 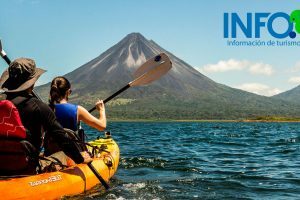 The Central Pacific Coast of Costa Rica is a land full of beautiful landscapes, bays, gulfs, hills, volcanoes, rivers and beaches of white, golden and dark sand, with crystal clear waters, where you will see the most beautiful sunsets in perfect contrast of colors worth seeing. 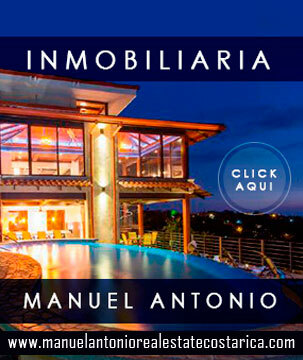 Manuel Antonio is known for being one of the most popular conservation sites in Costa Rica, hosting a small, but important biological reserve, where cattle ranching, agriculture and, undoubtedly, tourism and ecotourism abound. 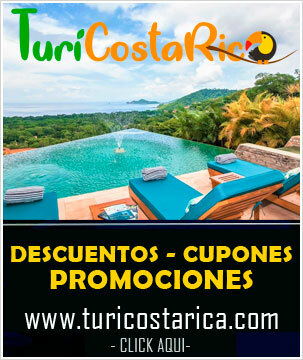 Costa Rica is a spectacular country in every way, nature, wildlife, beaches, gastronomy and its people, make a perfect complement, and without a doubt the Province of Puntarenas is a beauty, that gives life to wonderful places and National Park Manuel Antonio, very popular among locals and tourists for the practice of sport fishing, and attractive for enthusiasts of eco-tourism. Feel the fresh natural air impact on your face, listen to the breaking of the waves and the view aboard a boat on a catamaran tour in Manuel Antonio aboard the Ocean King, so you can enjoy one of the best tours in Manuel Antonio. 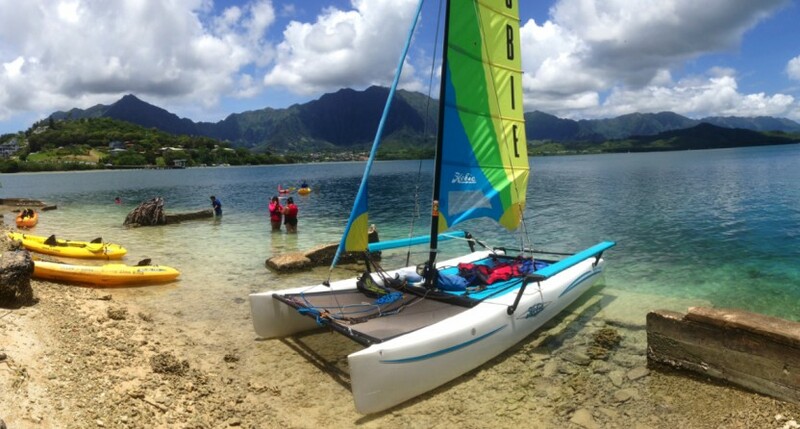 The Ocean King Catamaran is over 100 feet long, fully equipped with the latest technology and with all the comforts, providing safety, satisfaction and tranquility. In the facilities of the Catamaran you have 2 huge trampolines, 2 jacuzzis, two sinuous water slides, a spacious bar, living room and 4 bathrooms and showers. 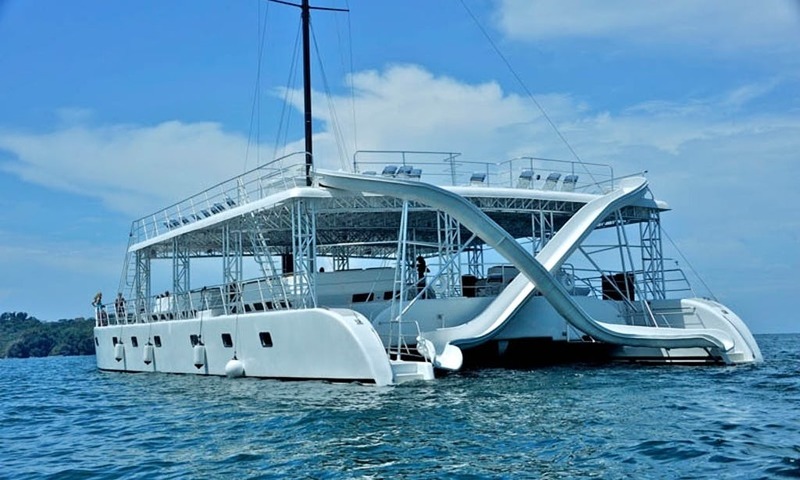 ¿Did you know that the Ocean King is one of the largest, safest and funniest catamarans in Costa Rica? So if you are on board the catamaran Ocean King in Manuel Antonio you will not regret it. The Ocean King has an all-inclusive system, fresh fruit, sandwiches, alcoholic and non-alcoholic beverages from the Costa Rican brand, for all tastes. The catamaran tour in Manuel Antonio begins with the transfer from your hotel in the Province of Quepos, and reaches the Marina of Pez Vela, taking you along the Costa Rican coast, and tropical islands, where you can swim, snorkel , or relax by having a piña colada. In the Catamaran adventure we offer you a relaxing and fun trip on board in a tour catamaran in Manuel Antonio, on this trip you will enjoy the beautiful beaches, the beautiful marine life from dolphins to whales that lives in the waters of Costa Rica, besides admiring Bird nesting areas, and more, on this trip you will be amazed at how beautiful nature is. One of the favorite stops for tourists is the Bay of Biesanz where snorkeling, diving and for wildlife lovers see monkeys, sloths, lizards, snakes and ocean formations for birds that fly overhead, all in one place. 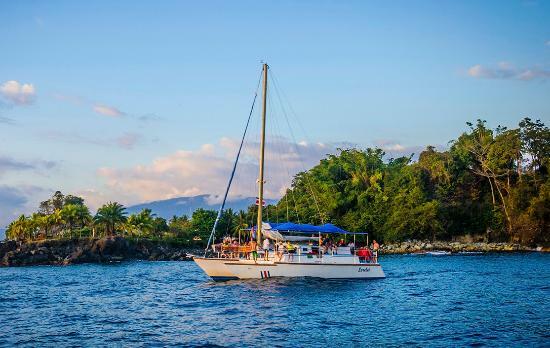 The catamaran adventure tour is all inclusive, with free sandwiches included, lunch or dinner with drinks and bus tour, as well as the stunning sunset in Quepos and Manuel Antonio. Enjoy the best of marine life on a catamaran tour in Manuel Antonio through the Pacific Ocean, touring Costa Rica’s Central Coast, where the spectacular panoramic view in front of you is just the beginning of an unforgettable day. Come with us to the Velero Camaradian, an incredible catamaran in Manuel Antonio, comfortable, full of security, and spaces where you can have fun and enjoy. The Velero Camaradian has food, drink and more, once you are on board this catamaran you will not want to get out unless it is to explore and enjoy the crystal clear waters of its beaches, and see its coral reefs, or immerse yourself and see the exquisite and exotic flora and fauna that inhabit their bays, such as the Bizans Bay, where you range from squirrel monkeys to the strangest species of reptiles, so for lovers of wildlife and natural life this is their place. As the sailboat slides silently under the sail and breaking waves, the dolphins can be part of the route, since they often follow the wake of the sailboat; also depending on the season of the year you will see whales and giant sea turtles, these are a wonder for the spectators.This catamaran tour in Manuel Antonio includes all the services, food, snacks, drinks and more, as well as diving, snorkeling at no additional cost. ¡Incredible! 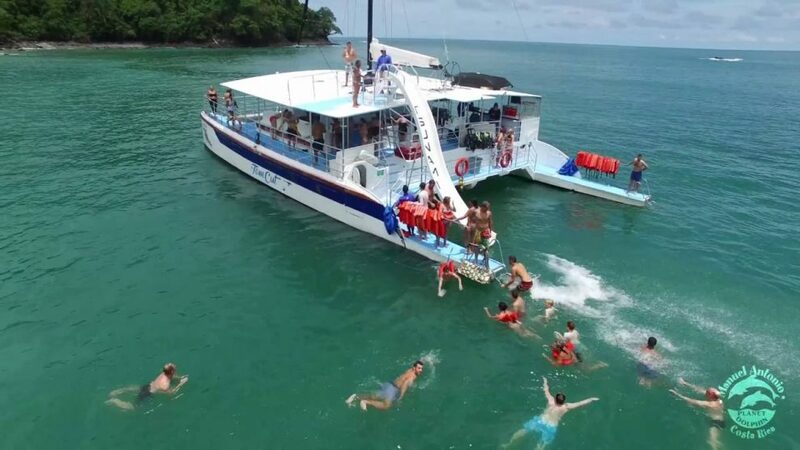 For lovers of marine life, the ocean and its beauty, the tour catamaran in Manuel Antonio is ideal, fun and out of the ordinary, as well as doing multiple activities while you delight in the beauty of the Pacific Ocean. 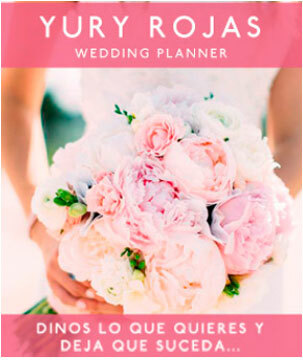 ¿What are you waiting for? If you are in Costa Rica you can not miss the opportunity to do a tour catamaran in Manuel Antonio.